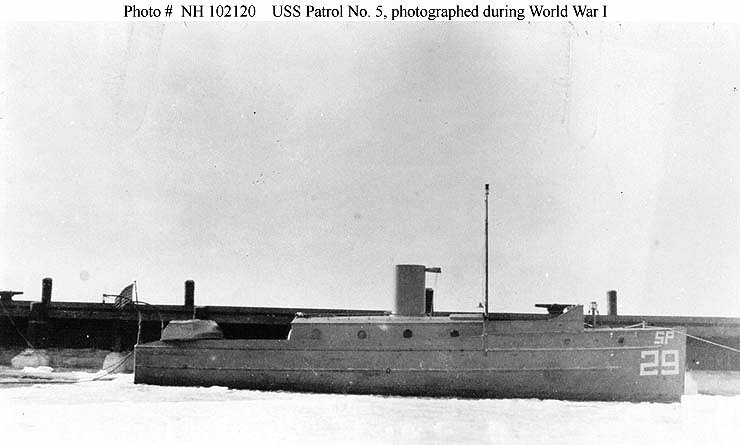 Motor Boat: Patrol # 5, a 40-foot motor boat built at Lynn, Massachusetts in 1916, was purchased by the Navy in April 1917 and commissioned soon afterwards as USS Patrol # 5 (SP-29). She operated in the Newport, Rhode Island, area for the rest of World War I. No longer needed after the Armistice, Patrol # 5 was sold in April 1919. Fate unknown. 46k Photographed during World War I. There is no DANFS History currently available for Patrol #5 (SP 29) at the Hazegray & Underway Web Site, the main archive for the DANFS Online Project.